The NVLink fingers on the TITAN V card are rudiments of the functional NVLink interface found on the Tesla V100 PCIe, being developed by NVIDIA, as the TITAN V, Tesla V100, and a future Quadro GV100 share a common PCB. The NVLink fingers on the TITAN V are concealed by the base-plate of the cooler on one side, and the card’s back-plate on the other; so the female connectors of NVLink bridge cables can’t be plugged in. NVIDIA has launched a new bridge that allows to connect two TITAN V in SLI via the NVLink interface. 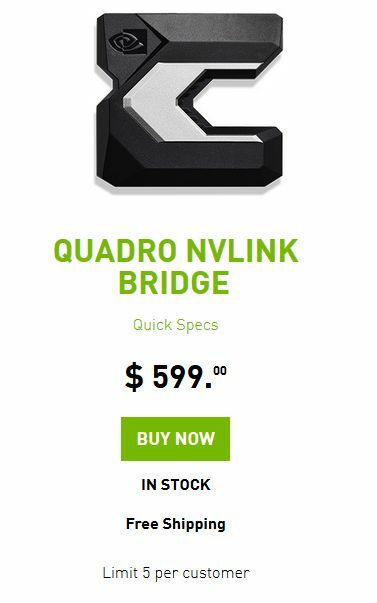 The NVLink bridge is priced at $599 on NVIDIA online store. This is a perfect price a $3000 graphics card!